I am absolutely in love with the Morning Cup set! I don't have it yet; but, after using it this past weekend, it's definitely on my "must have" list. This is a twist on the original design of the card. I changed up the colours; but I love the spirelli technique used around the tea cup. 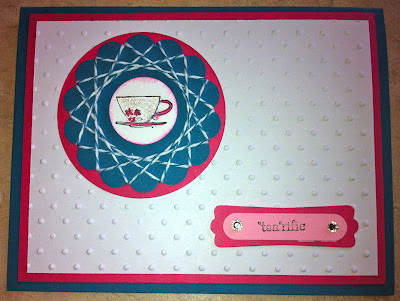 To learn how to duplicate this card, book your workshop now! June is filling up quickly because Hostesses can earn an additional $60 in FREE product. Don't miss your chance to take advantage of this awesome incentive. Email or call me to book your workshop today. You can also order these supplies online 24/7 by clicking my shop now link in the upper right hand corner.